Our Beethoven model celebrates the great composer and is launched in 2013, the year of the 14th International Beethoven Piano Competition Vienna and the 185th anniversary of our company. Beethoven was born in Bonn in 1770 and first visited Vienna in 1787, originally planning to study under Mozart. He was obliged to return home almost immediately as his mother became ill. He returned in 1792, after the death of Mozart, and began studying with Joseph Haydn. Prior to his departure, his patron Ferdinand von Waldstein wrote to him “Dear Beethoven! You are going to Vienna in fulfilment of your long-frustrated wishes. The Genius of Mozart is mourning and weeping overthedeath of her pupil. She has found a refuge but no occupation with the inexhaustibleHaydn; through him she wishes to form a union with another. With the help of assiduous labour you shall receive Mozart’s spirit from Haydn’s hands. Your true friend, Waldstein.“ Beethoven lived and worked in Vienna for the rest of his life(he died in 1827), helping it to further consolidate its position as the musical centre of Europe. He composed all of his immortal masterpieces there. IgnazBösendorfer started his piano factory in 1828, the year following Beethoven’s death,and his ideas of sound were very much shaped by Vienna’s cultural environment that was profoundly influenced by Beethoven. 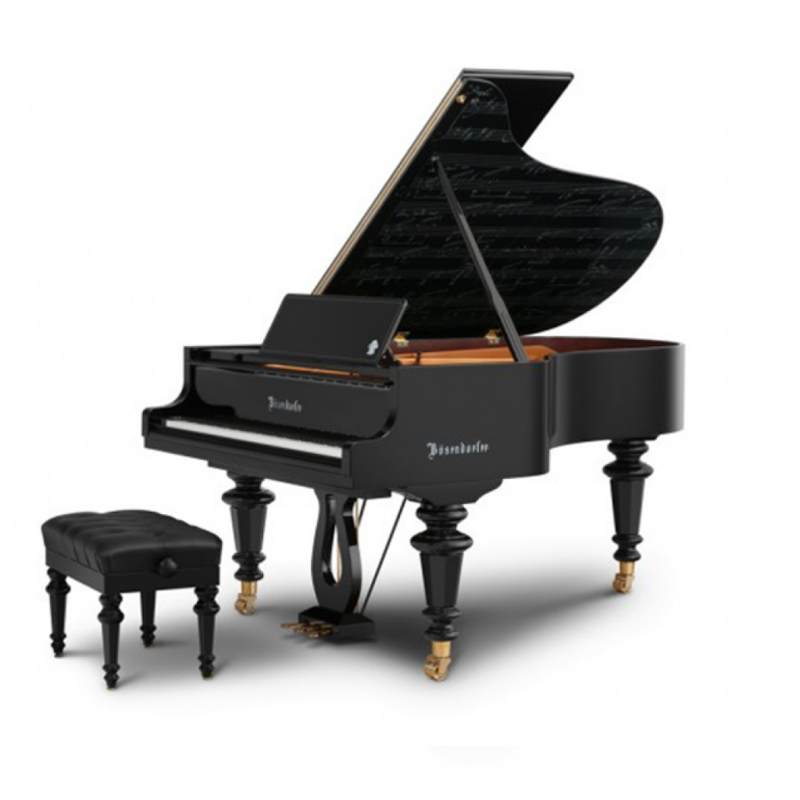 Many distinguished artists have chosen Bösendorfer pianos for their performance of Beethoven’s works. 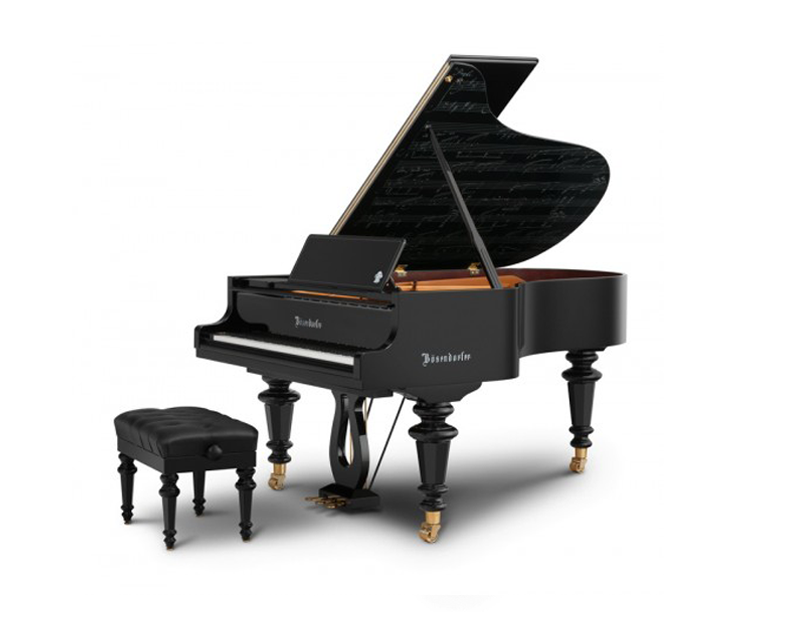 Our Beethoven model celebrates the great composer and is launched in 2013, the year of the 14th International Beethoven Piano Competition Vienna and the 185th anniversary of our company. In close cooperation with Beethoven-Haus Bonn, we have silkscreened onto the inside of the grand piano lid the opening measures of the Presto agitato from Beethoven’s “Moonlight” Sonata, Op. 27 No. 2, taken from the original autograph. In keeping with this “Moonlight” theme, we have used “moonlight” colour mother of pearl for our Bösendorfer name and for a logo of Beethoven on the music desk. Thismodel is limited to an individually numbered edition of thirty-two units, thenumberof Beethoven’s Piano Sonatas. Included with each instrument is a facsimileofthe original “Moonlight” Sonata manuscript published by Beethoven-Haus Bonn. This unique instrument, destined to become a collector’s item, is available in both 200 and 214 sizes.